The baths, as the information on the photograph confirms, were opened on 30 July 1891 in an opening ceremony performed by the mayor, Joseph John Seekings. The two pools could, at one time, be converted into use as a gymnasium. Based at the baths in 1945 were the Gloucester City Swimming & Polo Club, the Gloucester Ladies’ Swimming Club and Gloucester Gymnastic Club. 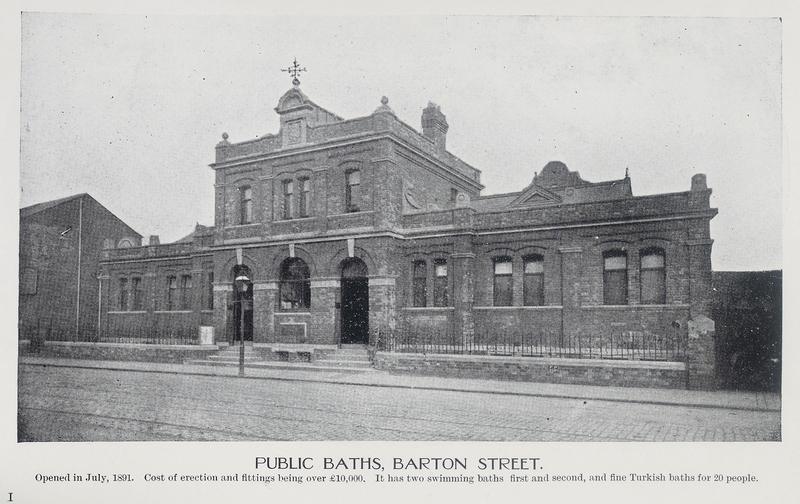 The baths were situated between numbers 85 and 87 Barton Street. The main pool was retained as a training pool after 1966 when the new Barton Pool opened nearby. You can click on the image to see a larger version. It is taken from the Gloucester Pictorial of c.1900. You can find memories of working at the Baths in the 1950s here. Would you like to share your own memories of the baths? You can make a comment below.